Tawn and I took a long weekend in Singapore, one of the first times I’ve actually celebrated the US Labor Day holiday since moving to Thailand. We have lots of friends in Singapore so there was plenty to keep us busy, plus there are many new attractions that fly in the face of the city-state’s reputation as a boring place. This entry was posted in Uncategorized and tagged Crab, singapore by christao408. Bookmark the permalink. Now that looks absolutely yummy and looks like lobster under sauce. That looks like one mighty big crab — a huge mouthful, anyway! 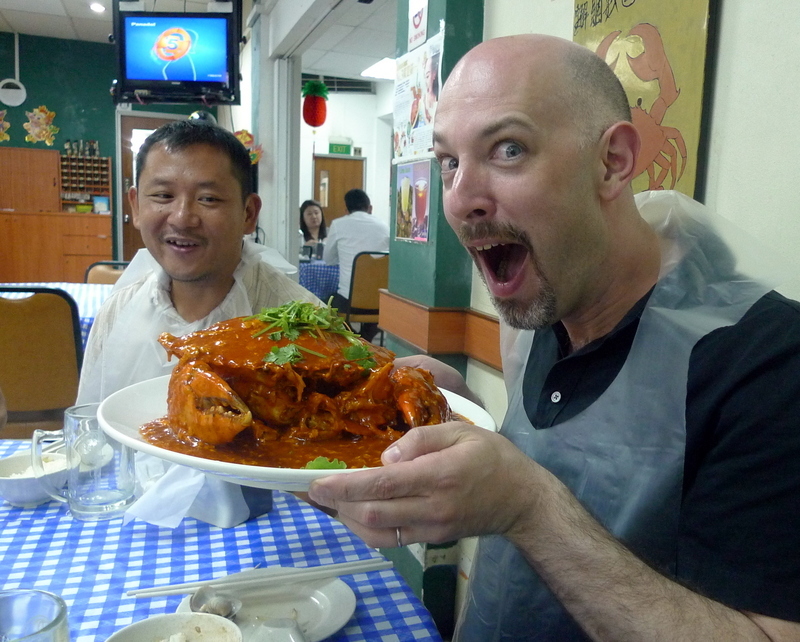 Chili Crab…mmmm. Did you get it from Jumbo’s? Chilli Crab!! Yikes!! Never liked that. Did Tawn dig in, too? @LostSock21 – Doubt it, this place doesn’t look like Jumbo’s Seafood. I am not a shell seafood lover, but I do like the sauce to go with rice….anyway…I’m going down to SIN again this Nov….. Seafood lover here – that got me to go to my local place today!! I suppose you got a nutcracker to help eat the crab? I know the Chinese like the inside of the body, you too? @agmhkg – Hmm interesting abreviation for Singapore. I guess SUX (airport abrieviation for Sioux city abrieviation ) also is a terrible nickname too. That is one huge crab. That is one maniacal photo! Looks like you are not inclined to share… I am now slobbering and will pause to get a snack. That’s one big scary crab! Look at the claws….so huge! Wow… so this is the real Chris!